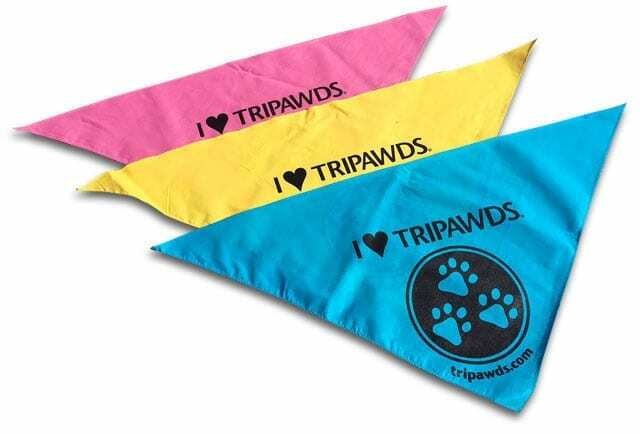 Name Your Price for a Tripawds Bandanna! We’ve been giving away Tripawd bandannas to three legged heroes ever since we started having Tripawd Parties, so we’ve decided to continue the tradition here! Show your support for the Tripawds Blogs community and discussion forums while helping us prove to the world that it’s better to hop on three legs than to limp on four. Now you can get your own Tripawd Pride bandanna simply by giving whatever you can. For a recommended contribution of just $12.50 in the U.S. (add $5 for international addresses) we’ll send you a colorful bandanna so you can show your Tripawd Pride at the dog park, in the pet boutique, and everywhere you go. 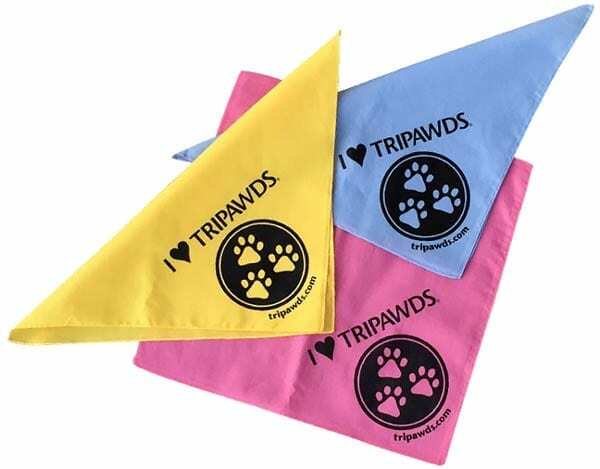 Name Your Price, Fly Your Tripawd Pride Flag! Give whatever you can afford, there’s no pressure. Think the suggested price is a bit steep? No worries, we understand. Just give what you think is appropriate. Able to give a bit more? Any amount you can give is greatly appreciated. 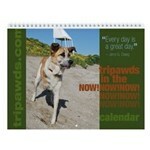 All proceeds help support our continuing efforts to keep Tripawds online. Please note that it costs us about nine dollars to produce and ship each bandanna. A donation of at least $12.50 is recommended. Covering this cost (at least) is ideal. Anything extra will help allow us to keep the Tripawds community online. Hosting Your Own Tripawds Party? If you want more than one Tripawds Rule! bandanna, simply give whatever you think is appropriate and indicate your desired quantity in the Comments field upon checkout at PayPal.com. *International addresses require at least $5 in additional postage. These new Tripawd bandannas feature the new Tripawds Badge of Honor. They measure 30 at the widest point, so they are sure to fit even the largest – and smallest – of our three legged friends. People have been asking for quite a while now where they can get a Tripawds bandanna for their three-legged hero. We are happy to make them available, and affordable, so all three legged animal lovers can have one. Select your size below and name your price! Visit the Tripawds Gifts Shop to select your preferred bandana color and size. Add a three paw sticker or button to help support your community if desired. Enter your shipping address, and checkout securely via paypal.com. No PayPal account is required. If you feel our recommended contribution of only $12 is a bit steep, no problem. Simply give whatever you can and we’ll send you a bandana. Aminimum donation of $6 is required. If you are able to give a bit more, please consider doing so to help support our continuing efforts to keep Tripawds online. No amount is to small and anything you can give is greatly appreciated. You will be redirected to Paypal for your secure donation. Want more than one? Just add as many as you want to your cart, or purchase separately if you want different colors. 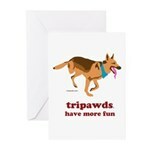 Got a special Tripawds pal? Give us her address and we’ll send a bandana on your behalf along with a special note card from Jerry! NOTE: It costs approximately $9.00 for to produce and ship a bandana anywhere in the U.S. Overseas delivery can cost $17 or more. No returns or exchanges are available. Perfect for three legged dogs of any size! Click the Add To Cart button to donate securely via Paypal. Be sure to indicate your preferred color and include your shipping address. Perfect for small breeds and three legged cats! Click the Add To Cart button to donate securely via Paypal. Be sure to indicate your preferred color and include your shipping address. 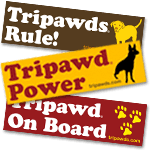 Add a Tripawds Sticker or Button at checkout to spread the word that Tripawds Rule! Just wanted to add that from now through September 30th, all bandanna purchases will count toward our Tripawds 2010 Fundraising Campaign! thank you and well done on the work you do. Of course! We’ll send out your bandanna ASAP. Thanks for your contribution and letting us know you wanted one. Best wishes for your pup. That’s right, Monkeybutt! Keep stealing those bandanas…we can make a quilt if we get enough. PS I will be contacting you this weekend. I have been trying to get on the computer without mumma seeing me, but she keeps catching me and I have to pretend to be chewing on the cord….heh heh…it really freaks her out. She’s like all, “NO. MATTIE, NO.” Like I’d be dumb enough to really bite into an electrical cord. Good grief. As an aside, “NO” is sort of my last name now. They hardly ever say my name without following with “NO.” Can’t do anything around here. As if shoelaces are sooooo hard to replace and like that tacky throw rug wasn’t on its last legs anyway…heh heh….last legs. Hi Jerry , Can I get one of your bandannas even though I live in the UK? Can I get one of your bandannas even though I live in the UK? Certainly, just provide your complete address and give whatever you can. Ideally we’d like to cover the the bandanna and shipping costs. Thanks! Thank you for your support! We’ll get your bandanna out to you ASAP. Sorry to hear about your pup, you’ll find lots of recovery and care tips in Jerry’s Required Reading List, and for immediate answers to the most common dog amputation questions download the new Tripawds e-book Three Legs and A Spare. Best wishes for a complete speedy recovery, please keep us posted in the forums. 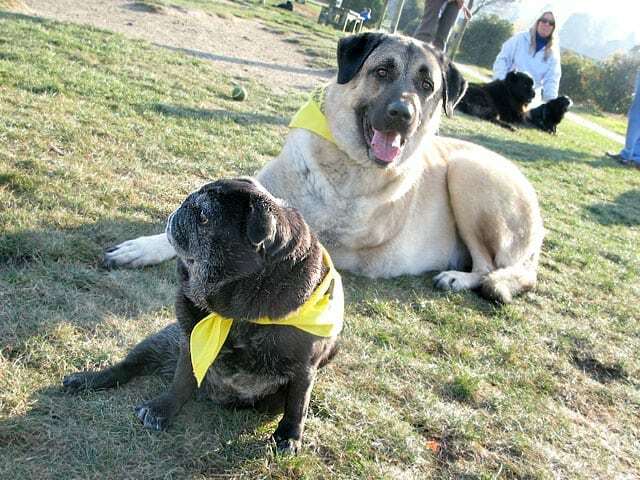 Love the bandanas, can’t wait to get one for Stella. Just logged on and donated to this wonderful site that has been such a help over the last month since Stella’s osiosarcoma diagnosis and amputation surgery. Thanks for all you do! Thanks for the comment Devon. We’ll get Stella’s bandanna in the mail ASAP, can’t wait to see a picture! Because I’m so deep in debt with Ellie’s surgery and vet bills I will only be able to spare $5 if that is okay. I shouldn’t even do that but I’d like to contribute. I have recently sent $15 donation but didnt to ask if Icould have a bandanna for my tripawd border-collie X – if you feel that the donation does not cover the price please let me know. We just sent our donation in — we need 3 bandannas so that we can rock our Tripawd spirit at our PacNW Tripawd Pawty in July! Thank you for sending the bandanas soooooooooooo quickly! I’m sure Jerry himself must have delivered them, as he can move cross country in a split second! Hope is in the process of choosing jewelry to match her bandana! Yay! I cant wait to get ours and show it off at the dog park!!! We just brought our 14 year old Schnauzer home from the Vet. three hours ago as she had her rt. front leg amputated due to a deep tissue sarcoma. Wife and I want to do all we can to support her, am most interested in acquiring any and all advice also would love to purchase a bandanna! @jbone We just missed you in the chat room! You’ll find lots of recovery and care tips in Jerry’s Required Reading List, and for immediate answers to the most common dog amputation questions download the new Tripawds e-book Three Legs and A Spare. My father’s beautiful Siberian Husky (who he loves more than this children, which i know, because im his son;]) is coming home on friday or monday after having her rear right leg amputated. I wanted to purchase your “Three Legs and a Spare” pdf, but he is the old-school, i dont need no damn computer-type. Is there a hard copy available? If not, I could just purchase/print, but I prefer something in a cover. Please let me know…thank you! Thanks for asking Evan, but we do not sell a hard copy edition of the e-book since its greatest value is in the hundreds of links to the best forum discussions, blog posts, and videos the Tripawds community has to offer. It does include other original content though, and others have purchased the book to have it printed and bound at their local copy shop. Best wishes for your dad’s pup! @ren Sure! We’ll ship anywhere, it just costs a little extra so please consider that when contributing whatever you feel is a fair price. Thanks for asking! I forgot to put a color! Can Bobbo get a blue one 😉 thank you! Monday will be his one month ampuversary!!! Thanks for asking menagerie! Additional postage costs to Australia would likely be approximately $7.00. I live in Canada. Can I buy a tripawd bandanna? What is the procedure to order? Thanks. Yes Lisa, thank you for asking. Please just consider the additional postage and time required to get it to you! Are these bandanas still available for purchase!? Yes! 🙂 Just click the Support Tripawds button.